Our name is taken from the small fish, once plentiful in West Coast waters and a staple in the diet of First Nations people to whom it was sacred. The oolichan, often referred to as the candlefish, is believed to possess healing powers and guarantee longevity. 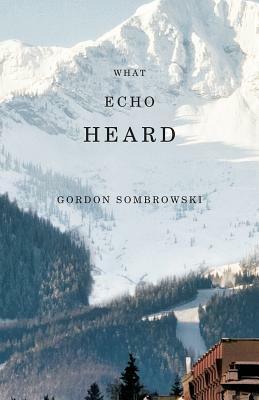 Not only is Fernie home to Oolichan Books, it is home to Gordon Sombrowski, author of this fine and wonderful short story collection, What Echo Heard. In this collection (which is wonderful, did I mention that?) Fernie is the link or the main character really, threading through each of the eleven stories. The synopsis on the back describes these stories as fables and tales and yarns and now, upon closing the pages and having the last few days to reflect on them, I think the use of the word “fable” perfectly expresses them. There are three stories given only a one-word title. These three were definitely my very favourite in the collection, with most certainly Mittens being rewarded a 5-star sticker. That little story had enormous impact, indeed I woke up the next morning still thinking of it. And that title, Mittens, becomes so apt after finishing. Mittens packs such an emotional punch. It is one of the stories that delves into Fernie’s past and its acceptance of immigrants and their experience, and yet, even more still. It’s powerful and my very, very favourite. Twice I teared up and that quiet, yet powerful ending will leave you closing your eyes and just meditating in the moment. The next was Silence. Beautiful. Again a powerful story with a title that becomes more perfect and fitting after finishing the story. The final one-word title is Hair. It also closes out the collection and once again, that title just perfectly encompasses and embodies the story. Am I purposely not sharing the content and details of these stories? Perhaps. Perhaps it’s just my ploy to get you to pick up a copy of What Echo Heard. I devoured this collection and anxiously await more from Mr. Sombrowski. His bio says he’s working on a novel and I sir, will definitely be one of the first to line up to read it hot of the presses. While What Echo Heard is a collection of short stories, each felt more than satisfying as though they were a full length novel. Never once after finishing any of the eleven did I feel like I was left hanging, or that the stories were unrealized or unfinished. They are truly wonderful. After finishing this collection, which I believe is my fifth short story collection, I truly believe we Canadians have mastered this genre. The Canadians are definitely more adept in it, certainly, the queen of the short story, a Canadian, was just given the ultimate literary prize. While I may be biased as of the five collections I’ve read all but one was not written by a Canadian, I’m firm in my opinion that they are superiorly written. Thank you again to Oolichan Books for the great pleasure of this collection. I’m looking forward to reading the other titles sent, and will more than likely start with Joanna Streetly’s Silent Inlet. Ooh. Sounds good! I’ll be adding it to my list too.